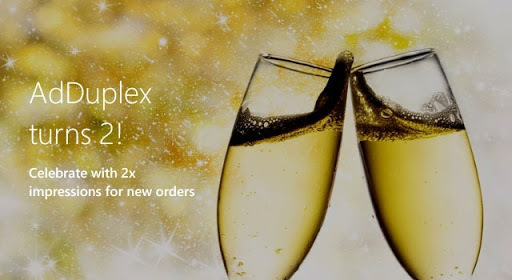 On January 17th, 2011 AdDuplex opened its doors to the first batch of users. Of all the related dates we think this is the one we should use as our birthday. So AdDuplex turns 2 today! I’ve decided to look at our second year in retrospect. Let’s see what was and wasn’t as good as we hoped. Number of apps on the network has almost quadrupled getting from 600 at the beginning of 2012 to almost 2,300 by the end of it. At the same time number of daily ad impressions has grown tenfold! We have expanded to Windows 8 and already attracted more than 120 Windows Store apps. A nice transformation over the year was seeing the reaction of people going from “Windows Phone what?” to something along the lines of “yes, I know who you are and what you do”. We were honored to be accepted to the Startup Sauna accelerator program and invited to their Silicon Valley trip. Recently our reports got quite some attention from the mainstream media to a point I was considering adding those cheesy “as seen on” badges to our front page. We’ve launched a new site and changed the logo thanks to the talents of the mega-talented Long Zheng. We have also rebranded from “ad exchange network”, which apparently was mostly confused with traditional ad networks, to “cross promotion network”. This write up wouldn’t be complete if I didn’t mention our failures. In 2011 driven by user requests and our own greed we’ve introduced “mixed model” – a way to monetize apps in addition to cross-promotion. In 2012 we understood that it was holding us back, distracting from our core focus on helping developers get more traction and discontinued it. It was a hard decision to kill a major feature that took a lot of time and resources to implement, but ultimately it was the only right decision to make. As any software project we’ve failed to deliver things as fast and as many as we hoped to. Our limited resources and falling back on the plans also resulted in our neglect for the maintenance of the featured apps section on our front page and our WindowsPhoneSites.com sub-project. We sure hope to address these in 2013. Overall it was a great year, though. We are sure 2013 will be even better. Celebrate our birthday with us – join the free cross-promotion network and/or advertise your apps, sites and services commercially. Buy credits in January and get 2 times more impressions with new orders plus free country targeting. Thank you very much for using AdDuplex and best of luck with your Windows Phone and Windows apps!